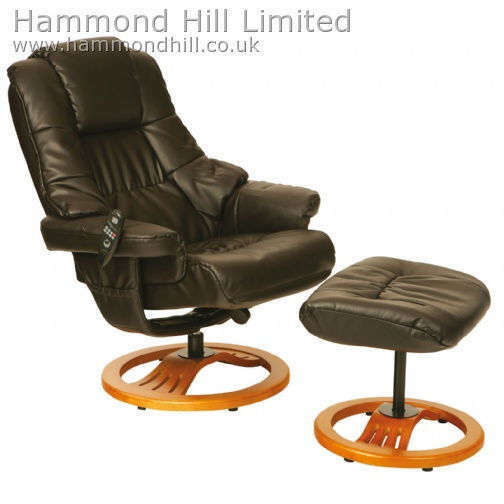 The Eros is a contemporary swivel massage recliner chair and footstool set. Featuring a well padded seat, soft arms and a sculpted back with head support section for added relaxation. Finished beautifully in brown bonded leather upholstery with a light wood round base. This chair features a vibration massage system to aid circulation and relieve muscle tension. Depending on where you live, delivery of this Relaxateeze Eros swivel Massage recliner & footstool will be made by either our in house delivery team or our one of our specialist couriers. You will be advised which method is being used when we arrange delivery. We will do our best to ensure that your Relaxateeze Eros swivel Massage recliner & footstool is delivered on the date agreed. There are times however when this is simply not possible due to unforeseen obstacles encountered by our drivers, whilst attempting to deliver the order. If the customer is not available when we attempt delivery we will return the goods to our warehouse and a new delivery date will need to be arranged.